Many of you may now shake their heads and say: Well I am already eating such a diet... even though, I didn't do it for its alkalizing effects. Good for you! As a SuppVersity reader you're familiar with the multifaceted benefits of sodium bicarbonate. Evidence that it will improve your performance, even when taken chronically, however, is still lacking. With a recently published study by Susan L. Caciano and colleagues we do yet have more evidence that this could be the case even though, we're not talking about bicarbonate supplementation, technically: In her study, Caciano tried to experimentally confirm the previous cross-sectional findings (Niekamp. 2012) suggesting that even a short term (4-9 days) low-PRAL, i.e. highly alkaline diet, would result in a higher respiratory exchange ratio during maximal exercise as compared to the SAD acidic diet. You will probably remember that Serial loading helps avoid the gastro-intestinal side effects from consuming large amounts of sodium bicarbonate in one sitting. Eventually, however, it is a special way to alkalize your diet aggressively. For each of the dietary interventions, the study dietitian provided the subjects with specific instructions on how to modify their habitual diets to achieve a low- or high PRAL diet. Ketogenic diets, acidic and problematic? The standard versions of low-carb or ketogenic diets have been shown to trigger significant decreases in blood pH (Yancy. 2007), of which the study at hand shows that they could trigger relevant performance decreases. Since eating more fruit is not an option, though, your vegetable intake should be as high as possible. On the other hand, the standard Western Diet will have similar consequences and the effects observed in the study at hand, as well as in previous studies could be corollary to the alkalinity of the diet and in fact caused by a mere increase in polyphenols, vitamins, dietary nitrate and other potentially performance enhancing substances in fruits and vegetables. The study dietitian was in contact with the participants (via telephone or email) every day during the dietary interventions to encourage compliance and to provide specific food suggestions as needed. The general strategy used for the low-PRAL diet was to increase the consumption of alkaline-promoting foods such as fruits and vegetables and to reduce the consumption of acid promoting foods such as meats, cheeses, and grains. More specifically, participants were instructed to consume 6-8 cups of vegetables and >4 servings of fruit each day. Because there is a tendency for lower energy intake with diets that are rich in fruits and vegetables, such as the low-PRAL diet, participants were instructed to eat frequently and consume energy dense foods during the low-PRAL trial, such as starchy vegetables (e.g. sweet potatoes), dried fruits (e.g. dates and raisins), and plant sources of fat (e.g. avocado, coconut, nuts, seeds). Foods with moderate PRAL values (e.g. legumes, yogurt, egg whites, quinoa) were allowed and were used to ensure that energy and macronutrient intakes were adequate. The participants were also advised to minimize the consumption of all meats, cheeses and common grains (most of which are high-PRAL) during the low-PRAL diet. During the high-PRAL diet, participants were instructed to consume at least 3-4 servings of common grains (e.g. wheat, corn, and oats), 3 servings of meat, and 3 servings of cheese (especially hard cheeses such as parmesan) each day while minimizing the intakes of fruits and vegetables. Moderate PRAL foods were allowed as desired as long as it did not displace high PRAL foods from the diet. 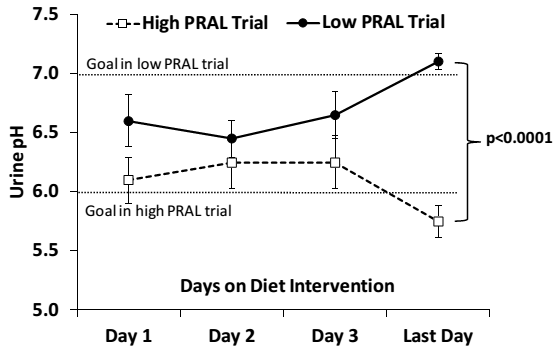 In general, the high-PRAL diet required less intensive counseling from the dietitian be cause it closely resembled the baseline diet of the participants. Now, obviously even the most tightly controlled study will have confounding effects that may mess with the results. For the time being, however, we will simply assume that the only thing the diets did (and were intended to do) was to achieve a dietary PRAL of ≤-1 mEq/d during the low- and a PRAL ≥15 mEq/d during the high-PRAL diet phases (I will get back to the validity of this assumption in the bottom line). As the scientists point out, "these cut points were based on PRAL values of the high and low PRAL tertiles that were observed in our previous cross-sectional study on 57 middle-aged men and women (Niekamp et al., 2012)" (Caciano). Whether the subjects achieved the desired level of alkalinity was measure with pH stripes in their morning urine. Figure 1: Fasted morning urine pH during the dietary intervention for the low- and high-PRAL interventions. The objective was to attain the pH goal in 4 days; however, up to 9 days were required for some participants. “Last day” indicates urine pH on the last day of the dietary intervention (i.e. 4 to 9 days), which was also the morning during which outcomes assessments were performed (Caciano. 2015); values are means, error bars are standard deviations. As the data in Figure 1 tells you, the dietary intervention successfully changed the urinary pH levels of which most critics of the idea of an "alkaline diet" say that it was as irrelevant as the PRAL-value, i.e. 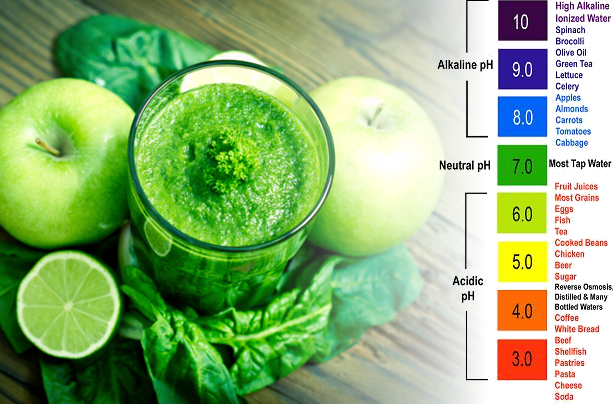 the degree of alkalinity of acidity of your diet, itself. Figure 2: Respiratory exchange ratio (RER | high = higher CHO/FAT oxidation) and performance time-to-exhaustion on the graded (left) and anaerobic (right) performance tests (Caciano. 2015). If this assumption is correct, the significant increase in RER (=increase in fat oxidation during the graded performance test), as well as the borderline significant and significant performance increases on the graded and anaerobic performance (+21%) test in Figure 2 would have to be explained by ergogenic effects of certain polyphenols, vitamins or other ingredients of fruits and veggies. This is possible, but just as hypothetical as the assumption that the changes were observed in response to a dietary-induced increase in serum bicarbonate. What about the conflict w/ previous observational data? Neither I nor the scientists have an explanation for the difference to the previously cited observational data by Niekamp et al who had found increased RER-values in individuals consuming a lower PRAL diet. One possibility is that the low PRAL diet was also lower in carbohydrates and thus triggered a decrease in RER. Another possibility the scientists plan to test in a future study is "that the shift in systemic pH altered the activity of enzymes that regulate lipid and carbohydrate oxidation [due to the pH-sensitivity] of carnitine acyl transferase-I, one of the rate limiting enzymes in lipid oxidation" (Caciano. 2015). High Dietary Acid Load Doubles Risk of Type II Diabetes in Lean Individuals! Causative or Corollary? Plus: Are Grains, not Meats the Main Offenders in the Modern Diet? Learn more about the benefits of alkaline diets in this SV Classic! Unlike the mere ingestion of increased amounts of fruits and veggies, the levels of bicarbonate in the blood has yet previously been shown to will trigger improvements in time-to-exhaustion from numerous studies on sodium bicarbonate. That the latter was in fact increased, even though the scientists measured only the urinary pH, which increased by by ~12%, can be assumed based on previous studies by Unwin and Capasso (2001); studies that confirm that the urinary pH is a reliable indicator of serum bicarbonate. Accordingly, Caciano et al. 's explanation that, both the performance increases and the borderline significant increase in VO2max (p = 0.08 | not shown in Figure 2) "could have resulted from an alkaline environment created by the consumption of low PRAL foods, and possibly by an increase in bicarbonate availability" (Caciano. 2015) is reasonable. For 66% of all athletes, sodium bicar-bonate will work; others get diarrhea. Bottom line: I guess, the performance benefits of the low-PRAL diet are about as undebatable as the beneficial health effects of increased intakes of fruits and vegetables. Practically speaking, we do thus not really need to know why the performance of the subjects increased significantly on the low-PRAL diet. What is important, though, is that the performance did increase statistically significant and to an extent that is practically relevant for every athlete who performs in competitions that require one or several 1-5 minute bouts of high intensity exercise... what? Yeah, that's probably more than 50% of all athletes. Addendum: For those who have been indoctrinated by self-proclaimed mythbusters and avengers of "the truth" or quacks who claim to be able to heal every ailment with certain dietary tweaks against or in favor of the benefits of "alkaline diets" here's an interesting overview (Schwalfenberg. 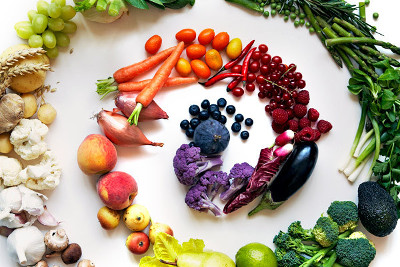 2011) of proven and unproven claims of what an "alkaline diet" may be good for | Comment! Caciano, Susan L., et al. "Effects of Dietary Acid Load on Exercise Metabolism and Anaerobic Exercise Performance." Journal of sports science & medicine 14.2 (2015): 364. Niekamp, Katherine, et al. "Systemic acid load from the diet affects maximal exercise respiratory exchange ratio." Medicine and science in sports and exercise 44.4 (2012): 709. Schwalfenberg, Gerry K. "The alkaline diet: is there evidence that an alkaline pH diet benefits health?." 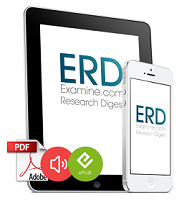 Journal of Environmental and Public Health 2012 (2011).